After the release of Doraemon's 2010 movie, Doremi Fansubs had again released another movie of everyone's favorite futuristic cat! 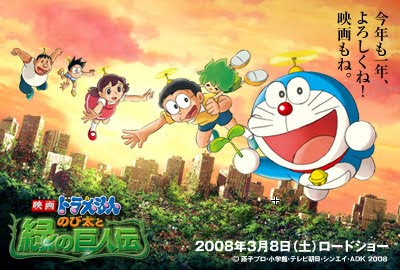 Doraemon the Movie: Nobita and the Green Giant Legend is the series' 2008 full length anime movie feature. The film opens with the mysterious dialogue about the change of vegetation and environment on Earth : thaw conditions, exploitation of land depletion, rising sea levels, the status of urbanization... Nobita picked up a tree and helped it to work like animals with Doraemon's invention, and named it Kibo. Doraemon and his friends were having fun playing with Kibo, until one day, they found a region of the forests disappearing.